Cat’s Claw or Uña de Gato (Uncaria tomentosa) has antioxidant, antiviral, anti-abnormal cell growth, antimicrobial, and anti-inflammatory properties and may be helpful in the treatment of abnormal cell growth, AIDS, arthritis, rheumatism, asthma, bursitis, genital herpes, herpes zoster, ulcers, candidiasis, lupus, chronic fatigue syndrome, PMS, menstrual irregularities, gastric ulcers, abnormal cell growths, gonorrhea, hemorrhoids, gastritis, colitis, diverticulitis, high blood pressure, high cholesterol levels, and stimulating immune function. 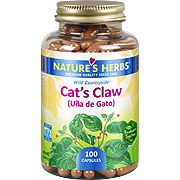 Cat’s Claw continues to serve as an all-in-one immune system supporter. If your system remains in a dilapidated state because of excessive masturbation, try Poor Immune System Caused by Over-Masturbation available at herballove.com to see an improvement. As dietary supplement, take 1-2 capsules 3 times daily. Wild Countryside Cat's Claw bark. Cat's Claw is shipped in a discrete, unmarked package. Orders are processed immediately and usually take about 3 to 5 working days to be received. We do ask that you try it for 2 to 3 weeks to feel the full effects. Any information received is used only for order processing and shipping purposes. Your information, such as e-mail address, will never be disclosed to a third party.